Host of the wildly popular statewide show “T-Row in the Morning Show,”. Now considered the 5th most famous “Toby” in America behind Toby Keith, Tobey Maguire, Toby from The Office, and Toby Harrah. Funny, fat and fantastic! Ladies love him and men want to be like him. You’ll laugh, you’ll cry, you’ll have a stomach ache. A 2 time Emmy award winning sportscaster for KWTV, Toby joined the OU football broadcast as the sideline reporter in 2009, but has also done extensive radio and television play-by-play work for Sooner men’s and women’s basketball, baseball, softball and wrestling. 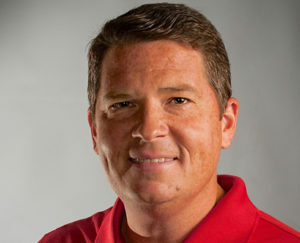 In 2011, Toby became the “Voice of the Sooners” for the University of Oklahoma football, men’s basketball and baseball games. A Cincinnati Reds, Indianapolis Colts and Indiana Pacers fan, Rowland has witnessed very little success from his favorite professional teams, which may help to explain why his is so bitter toward “bandwagon” fans like Myron Patton and P.J. Mills. Toby is married to the most beautiful woman in the world, Jenni, and has three children, Trevor, Payton and Chloe. He has a Labrador retriever named “Buddy” and once while he was playing golf, killed a gopher with a 9-iron.